In celebration of The Shape of Speed, and the first of three Streamlined Sundays, the Museum presents Motorcycles in the Park. Join us for a day of outdoor fun on the Park Blocks, plus gallery exploration and amazing motorcycles! Registration for bike showcase is open through June 12. Interested in showing off your ride? Submit a registration form for Motorcycles in the Park—when Portland Art Museum hosts a day of outdoor fun in celebration of our special exhibition The Shape of Speed: Streamlined Automobiles and Motorcycles, 1930-1942. Accepted motorcycle entries will be showcased on the Park Blocks where visitors can learn from enthusiasts about motorcycle building and collecting. 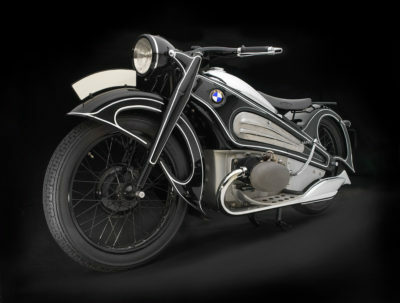 BMW, R7 Concept Motorcycle, 1934. Photo: Peter Harholdt. BMW’s sleek, streamlined, one-of-a-kind R7 Concept Motorcycle appeared at major shows in Germany in 1934, then was crated up and lost until it was discovered in 2005, and restored by BMW craftsmen. Highly advanced for its day, with a pressed steel frame and full bodywork, the R7 is a remarkable survivor—and a bike that was well before its time.